Upon arrival, Deputy Dean detained four subjects who each had plastic jars full of cash and coins. Along with the cash, each juvenile had a large white sign with a photo of an unidentified infant. 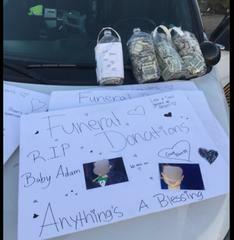 The signs indicated the money being collected was to fund a funeral for the infant. After contacting the San Bernardino County Coroner's Office and further investigation, it was determined the information on the signs was false. The four subjects, identified as Shane Alexander and three male juveniles, were found to have collected over $800.00. Alexander and one of the juveniles were cited for theft by fraud. The juveniles were released to their guardian and Alexander was released at the scene. The case will be forwarded to the District Attorney's Office for review and filing of charges.